A satellite image of shows damage after an explosion at the Fukushima Daiichi Power Plant in quake-ravaged Japan.Flickr/<a href="http://www.flickr.com/photos/digitalglobe-imagery/5525887859/in/set-72157626248178510/">DigitalGlobe</a>. This was originally posted on Saturday, March 12 at 2:01 PM EST and is being updated regularly. Some of the information at the top is very basic; if you’re familiar with the outlines of the problem, you can jump straight to the latest updates. Fears of a potential nuclear catastrophe are high in northern Japan, where multiple explosions have occurred at the Fukushima Daiichi Nuclear Power Station and the cooling systems at four separate reactors are suffering problems. Officials have reported that a partial meltdown has likely occured at three reactors, though the extent of the damage to their cores is not yet clear. Spent fuel rods at a fourth reactor also threaten to melt down. The emergency at the plant comes on top of the devastation caused by an 9.0-magnitude earthquake and a 33-foot tsunami. What is wrong with the plant? There are six boiling-water reactors on the site, though only three were in operation at the time of the earthquake. These systems, designed by General Electric, rely on an influx of water to cool the reactor core. But the water systems require electricity that was cut off by the earthquake. It also appears that something—the initial quake, the tsunami, or aftershocks—knocked the site’s back-up generators offline. Without the cooling system bringing in water, the core of a reactor will start to overheat—which in turn heats up the water already in the system and causes more of it to turn to steam. Emergency responders have been forced to vent some of the steam, releasing radiation, in order to prevent the containment domes from exploding. They are in a race against the clock to bring in new water supplies before the reacting nuclear fuel heats up beyond control. It is believed that all of units have already suffered a partial meltdowns of their reactor cores—the uranium fuel rods where the nuclear chain reaction happens—and four of the plants have been damaged by explosions or fires. There was a blast on Saturday March 12th at Unit 1, followed by explosions at Unit 3 the following Monday and Unit 2 on Tuesday along with a fire at Unit 4, where spent fuel rods may have boiled off all of the water in their cooling pond. Tokyo Electric Power Company, the owner of the plant, has been flooding the reactors with a mix of sea water and boric acid, which is used to slow down the chain reaction. They have encountered multiple problems, however, with keeping water levels up. Leaving the rods exposed causes them to heat up faster and increases the risk of a meltdown. How large is the area affected by radiation? Trace levels of radiation from the plant are expected to travel thousands of miles. Of course, radiation powerful enough to pose a health threat will cover a much smaller area. The Fukushima plant is about 160 miles north of Tokyo, and residents within a 12.6-mile radius have been evacuated. However, US officials have advised Americans in Japan to evacuate to at least 50 miles from the plant. British authorities are recommending that their citizens leave Tokyo and the whole of northern Japan. It’s still unknown how large an area will be seriously affected. On March 13th, the aircraft carrier USS George Washington, which is docked at the US naval base in Yokosuka 200 miles south of the reactors, detected “low levels of radioactivity” on its decks. The ship’s commander recommended the military personnel limit outdoor activities. A 17-man Naval helicopter crew flying a relief mission about 60 miles from the reactor passed through a radiation plume that exposed them to a month’s worth of radiation within one hour. A US Navy spokesman told Bloomberg that low-level radiation exposure will probably become “a fact of life” for military personnel flying relief missions in the area. Levels of radiation more than four times the legal limit have been found in milk more than 40 miles from the plant. Radiation has also contaminated local crops and tap water. The IAEA reports that officials are working in the most affected areas to distribute iodine tablets, which are used to block the absorption of radiation. Will the radiation reach the West Coast of United States? Yes, but experts don’t think the levels will pose any danger. MoJo’s Julia Whitty has a rundown of the latest modeling and key uncertainties. Where can I learn more about the science and health effects of radiation exposure? Here and here. UPDATE 1:20 PM EST SATURDAY 3/12: Via the Nuclear Energy Institute, the trade group representing the nuclear industry in the US, the IAEA is listing the situation at Fukushima Daiichi as a level 4 on the International Nuclear and Radiological Event Scale. For some perspective on this 7-point scale, the 1986 Chernobyl disaster in the Ukraine was rated a 7 and the 1979 Three Mile Island accident in Pennsylvania was rated a 5. UPDATE 3:40 PM EST SATURDAY 3/12: Robert Alvarez, a senior scholar at the Institute for Policy Studies and a former senior policy advisor to the Secretary of Energy in the Clinton administration, says that the plan to use sea water to attempt to cool the reactor is an “act of desperation.” “I would describe this measure as a ‘Hail Mary’ pass,” said Alvarez. Kenneth Bergeron, a physicist who previously worked on nuclear reactor accident simulation at the Department of Energy’s Sandia National Laboratories, also noted that this is a “very unconventional” method for trying to cool the reactor. Bergeron described what’s going on at the plant is known as “a station blackout”—both a loss of external power and a failure of the on-site emergency power. This kind of situation is “considered extremely unlikely,” said Bergeron, though it has been a major concern for decades that something like this could happen. “We are in uncharted territory,” said Bergeron. It’s also worth noting that the previous two major nuclear power plant incidents in world history—Three Mile Island and Chernobyl—happened without the context of a larger national emergency like the one that Japan is now experiencing. This, of course, impacts the number of responders available, as well as the communication systems being used to inform residents about the status of the power plant and evacuation plans. UPDATE 4:45 PM EST SATURDAY 3/12: The Japanese newspaper Nikkei is reporting (via STRATFOR) that the Nuclear and Industrial Safety Agency has confirmed that Unit 1 of the plant is in meltdown. However, this conflicts with an earlier statement from Japanese Chief Cabinet Secretary Yukio Edano, who says that the reactor was not damaged. At this point it’s not clear exactly what the status is. UPDATE 5:13 PM EST SATURDAY 3/12: The explosion was reportedly caused by a build up of hydrogen, which is an extremely flammable gas. The explosion appears to have occurred in the larger containment building surrounding the reactor core, though it is still not exactly clear whether the explosion damaged the core itself. I just talked to Tom O’Donnell, a nuclear physicist, who explained that the increasing water temperature inside the reactor likely caused hydrogen to build up in the core. Worried about putting pressure on the core, plant operators would have wanted to vent the hydrogen, which may have then caused the explosion. Some news organizations are reporting that the reactor may have been breached, noting the presence of iodine and cesium isotopes detected in the area. O’Donnell notes that some level of those isotopes could be present in the water because the cooling system is broken down, causing what are usually two separate loops of water in a boiling water reactor system to intermingle. If the levels are high, though, it could be evidence that the reactor core has, in fact, been breached. Reporting on the levels of those isotopes is fuzzy right now though. UPDATE 5:22 PM EST SATURDAY 3/12: Tokyo Electric Power Company (TEPCO), which owns the Fukushima plan, is also posting regular updates. UPDATE 6:02 PM EST SATURDAY 3/12: The unit in question is a General Electric Mark I reactor design, also called a “pressure suppression” system. It’s a pretty common model; of the 104 reactors in the US, 23 are this type. But there are concerns that this design doesn’t necessarily provide the best containment in the event of a meltdown. If they are unable to cool the core and it does melt through the reactor vessel, this model doesn’t have most robust containment system, says Bergeron. If it did meltdown and the reactor core slumped to the floor, it likely “would result in containment failure in less than a day,” he says. UPDATE 6:08 PM EST SATURDAY 3/12: Japan’s nuclear agency is now reporting that the cooling system on Unit 3 at the Fukushima Daiichi plant has also malfunctioned, according to the Associated Press (via the Los Angeles Times). UPDATE 6:22 PM EST SATURDAY 3/12: Several people have asked me what this incident says about whether nuclear plants are built to withstand earthquakes. Plants are supposed to be able to handle the anticipated quake intensity and likelihood relevant to their location, but it appears that this quake in Japan was far stronger than anticipated. Moreover, the problem here looks to be more of a power supply issue, a secondary effect of the quake and tsunami. It’s the combination of events that created the bigger problem here. As Ellen Vancko, the nuclear energy project manager for the Union of Concerned Scientists and a former staffer at the North American Electric Reliability Council told me earlier today, “The one lesson we can draw from Japan is no matter how technologically advanced we are as a society, it’s virtually impossible to plan for every curveball Mother Nature is going to throw at us.” That said, it’s probably not a great idea to put a nuclear power plant on an active fault line. UPDATE 6:33 PM EST SATURDAY 3/12: TEPCO says it is preparing to vent Units 2 and 3 to relieve pressure in the reactor containment vessels. UPDATE 11:01 PM EST SATURDAY 3/12: Japanese Chief Cabinet Secretary Yukio Edano said Sunday that a partial meltdown is likely underway at a second reactor at the site, the Associated Press reports. UPDATE 11:11 PM EST SATURDAY 3/12: Citing TEPCO documents, the Wall Street Journal reports that the plant was only designed to sustain a 7.9 magnitude earthquake. Friday’s earthquake, the largest in Japan’s history, has been upgraded to a 9.0. UPDATE 11:36 PM EST SATURDAY 3/12: The Nuclear Energy Institute explains Japan’s radiation measuring system. UPDATE 12:43 PM EST SUNDAY 3/13: Japanese officials have confirmed that a partial meltdown at both Unit 1 and 3 is likely to have occurred, meaning that some uranium fuel rods have been damaged. The officials also stated, via the New York Times, that up to 141 people have been exposed to radiation, and three workers at the site have developed radiation poisoning. UPDATE 12:55 PM EST SUNDAY 3/13: The IAEA confirms that a state of emergency has also been declared at the Onagawa nuclear power plant, after heightened levels of radiation were detected there. Officials said that the cooling systems at that plant are working, however, and it appears to be under control. Japan’s Nuclear and Industrial Safety Agency (NISA) also confirmed the presence of caesium-137 and iodine-131 isotopes in the area around Unit 1 to IAEA. UPDATE 1:23 PM EST SUNDAY 3/13: TEPCO says that 260,000 homes in its service area are without power. The Japanese daily Nikkei reports that the company is going to begin rolling blackouts at 6:20 a.m. Monday in hopes avoiding a widespread blackout. Nuclear accounts for 30 percent of Japan’s power, so the emergencies at multiple plants have put a pretty significant dent in the electricity supply. UPDATE 2:31 PM EST SUNDAY 3/13: Kyodo News is reporting that a fourth plant, Tokai, is experiencing problems with its cooling system pumps. UPDATE 2:40 PM EST SUNDAY 3/13: In trying to learn more about earthquakes and nuclear safety, I came across this 2010 paper, “Nuclear Seismic Safety,” from the Electric Power Research Institute (EPRI). It notes, among other things, that “earthquakes have yet to cause a single significant safety incident at a nuclear power plant.” So much for that. The question that arises out of the Japanese situation, though, is what happens when the actual earthquake exceeds the predicted risk. It’s become clear that the Fukushima reactors were not built to withstand a 9.0-magnitude quake, but rather were built on the expectation that a 7.9 was the maximum the plant would experience. The paper also touts Tokyo Electric Power Company’s Kashiwazaki-Kariwa Nuclear Power station as a case study in success, noting that it withstood a 2007 earthquake that was about three times stronger than it was designed to. But the paper also states, rather importantly, that “the Richter scale alone does not capture the dangers or risks posed by specific quakes.” This seems to be the real problem in Japan. The emergency situations affecting at least four nuclear power plants in the country seem to be more related to the their ability to withstand multiple disasters—an earthquake, tsunami, and the failure of both primary and back-up power—not just an earthquake alone. UPDATE 3:00 PM EST SUNDAY 3/13: Japan’s Chief Cabinet Secretary Yukio Edano warns that a hydrogen explosion is also possible at Fukushima’s Unit 3 reactor, via the Telegraph. The heat inside the reactor is causing a build up of hydrogen inside the outer containment building, and the gas is extremely flammable, which creates a high likelihood for an explosion like the one that occurred Saturday at Unit 1. UPDATE 9:33 PM EST SUNDAY 3/13: They’re still struggling to bring Unit 3 at Fukushima under control. The IAEA reported Sunday evening that TEPCO has been venting the containment building to relieve pressure from the buildup of hydrogen inside, but officials are still concerned that a second explosion may occur like the one that damaged the containment building at Unit 1. Water levels inside the reactor vessel increased steadily for a certain amount of time but readings indicating the water level inside the pressure vessel are no longer showing an increase. The reason behind this is unknown at this point in time. One particular concern with Unit 3 is the presence of mixed-oxide (MOX) fuel in the core. MOX is a mixture of plutonium and uranium oxides. In September 2010, plant operators loaded 32 fuel assemblies containing MOX fuel into this reactor. That amounts to approximately 6 percent of the core. MOX fuel generally worsens the consequences of severe accidents in which a large amount of radioactive gas and aerosol is released compared with non-MOX uranium fuel because MOX fuel contains greater amounts of plutonium and other actinides, which are highly toxic. UPDATE 10:52 PM EST SUNDAY 3/13: The Associated Press is reporting that there has been an explosion at Unit 3, citing a “massive column of smoke” coming from the distressed unit. IAEA has confirmed the explosion occurred at 11:01 AM local time, though the agency is still seeking details. UPDATE 11:59 PM EST SUNDAY 3/13: There’s a live-feed of Japan’s NHK-TV, in English, here. UPDATE 9:45 AM EST MONDAY 3/14: As of Monday evening local time, responders were struggling to control at third reactor at the power plant, Unit 3. Water levels plummeted after the cooling system failed, exposing the fuel rods. Nikkei reports that the levels have recovered somewhat, though six feet of the rods remain exposed, which could cause significant damage to the rods. UPDATE 4:00 PM EST MONDAY 3/14: Sorry for the lack of updates today. I’ve been trying to track down information for a full story for tomorrow. Suffice it to say that the situation at Fukushima is still grim. TEPCO is having problems getting the water level back up in Unit 2, and the fuel rods remain exposed. The longer they’re exposed, the more the rods heat up, which increases the pressure and the potential that they could damage the containment vessel. The Times has a good update here. UPDATE 6:27 PM EST MONDAY 3/14: ProPublica has a good piece explaining why the status of the spent fuel rods at the site is another issue to be concerned about. The tanks that cool the spent rods on this model are outside of the containment building, and it’s not clear whether they were damaged in the two explosions. UPDATE 7:48 PM EST MONDAY 3/14: Japanese officials are now reporting a third blast at the power plant that apparently took place at 6:10 a.m. Tuesday local time. Nikkei is reporting that Unit 2’s pressure-suppression system was damaged in the blast, according to the Nuclear and Industrial Safety Agency. This would indicate that this blast may have been different or more severe than the previous two explosions, which only affected the outer containment structure. UPDATE 9:17 PM EST MONDAY 3/14: TEPCO officials are reporting elevated radiation levels at the site—8,217 micro sievert, which is eight times the legal annual limit of exposure for an individual. The officials believe the containment vessel may have been damaged in the blast, reports Kyodo News. UPDATE 10:40 PM EST MONDAY 3/14: An explosion occurred at Unit 2 early Tuesday morning local time and a fire has also broken out at Unit 4, Japanese Chief Cabinet Secretary Yukio Edano confirmed in a news conference. Unit 4 was offline at the time of the earthquake, but it does contain spent fuel rods, which creates the possibility that additional radiation could be released from that unit. The blast at Unit 2 may also have caused damage to the reactor’s containment unit. Edano confirmed increased radiation risk at the site. “Now we are talking about levels that can impact human health,” he said. UPDATE 5:15 AM EST TUESDAY 3/15: The power company has reported that the fire at Fukushima’s Unit 4 is out. The situation at Unit 2 remains precarious, and 800 workers have been evacuated, while 50 remain to work on pumping seawater into the reactor. The New York Times’ Hiroko Tabuchi, who posts regular Twitter updates on the situation, notes that one concern is that continuing radiation releases from No. 2 could force workers at the other reactors to evacuate, increasing the risk of a meltdown at all three. UPDATE 12:17 PM EST TUESDAY 3/15: How much damage that the fire caused isn’t exactly clear. The IAEA reports that the fire lasted two hours, but they are still “seeking clarification on the nature and consequences of the fire.” Meanwhile, the explosion at Unit 2 “may have affected the integrity of its primary containment vessel”—though the extent of the damage is also not clear at this point in time. UPDATE 3:30 PM EST TUESDAY 3/15: France’s Nuclear Safety Authority says that the situation in Japan should be upgraded to a level six on the International Nuclear and Radiological Event Scale, which would put it just below Chernobyl (which was a 7). Japan’s Nuclear and Industrial Safety Agency maintains, however, that it’s still a 4 on the scale. UPDATE 4:55 PM EST TUESDAY 3/15: The situation at Unit 4 continues to be grave, with officials reporting that “water in a pool storing spent nuclear fuel rods may be boiling,” according to Kyodo News. The unit was offline at the time of the earthquake, but the pool containing spent fuel rods caught fire yesterday. Keeping those rods cool and submersed in water is crucial to preventing an even more significant release of radiation. The New York Times reports that TEPCO officials said they are considering using helicopters to douse the troubled reactors. UPDATE 6:35 PM EST TUESDAY 3/15: Another fire has broken out in the Unit 4 reactor, according to TEPCO officials (via the Associated Press). UPDATE 9:53 PM EST TUESDAY 3/15: NHK-TV is showing live footage of white smoke billowing out of the Unit 4 reactor. The footage, shot from a helicopter 19 miles away, shows a constant flow of smoke from the site where a fire was reported earlier. UPDATE 10:44 AM EST WEDNESDAY 3/16: The steel containment vessel on Unit 3 may also be ruptured, Edano said at a press conference Wednesday. Damage to Unit 2’s containment vessel had already been reported, meaning that both could release harmful radiation. This is in addition to fires at the Unit 4 reactor. UPDATE 12:31 PM EST WEDNESDAY 3/16: DigitalGlobe has released a satellite photo of the site, with annotations from the Institute for Science and International Security, that helps understand the situation right now. The chair of the U.S. Nuclear Regulatory Commission warned this afternoon that all of the water is gone from the spent fuel pool at reactor four of the Fukushima Daiichi nuclear plant, causing “extremely high” radiation levels. UDPATE 6:10 PM EST WEDNESDAY 3/16: The Fukushima Daiichi nuclear power plant still threatens to spiral out of control. The biggest threat may come from the plant’s spent fuel rods, which might have boiled off a significant amount of the water in their cooling vessels. Today, TEPCO has admitted to Kyodo News that the fuel rods could go critical. “The possibility of recriticality is not zero,” a spokesman for the power company said. If that situation came to pass, it could cause the fuel rods to break open and release their radioactive contents. If the fuel rods are dry and hot, there could be damage to the cladding and the release of light radioactive nuclei. To prevent that, you would want to inject water. But water on its own is a neutron moderator and would enhance the chances, however small, of criticality… [water] reduces the speed of the neutrons, meaning they can be captured by uranium nuclei in the fuel rods, inducing them to split. Without water, the neutrons travel too fast, and are not captured. TEPCO is planning for the possibility that the rods have already broken open. Kyodo News reports that the company is considering dousing the rods with boric acid by helicopter. Unlike water, boric acid would be able to contain the neutrons and hopefully stave off a complete meltdown. There appears to be disagreement between Japanese and US officials over the appropriate response to the disaster. The US embassy in Japan is telling Americans to evacuate the area within 50 miles of the power plant—four times the distance that the Japanese government has required. According to an anonymous US official who spoke to ABC News, the administration is pleading with the Japanese to launch a “suicide mission” to prevent a full meltdown. Probably not the best way to describe it, even if it’s true. UPDATE 7:16 PM EST WEDNESDAY 3/16: It’s now just after 8 a.m. in Japan. A piece in the Kyodo News datelined 3/17 reports that the US military will deploy Global Hawk unmanned high-altitude reconaissance aircraft to take images of the inside to the building the houses the #4 reactor. According to The Telegraph, nuclear engineers in France, a country known for its nuclear technology, are “pessimistic” that Japan will be able to prevent a meltdown at Fukushima. The British Foreign Office has advised all British citizens to leave Tokyo—a city that is 140 miles south of the plant—and the whole of northern Japan. The European Union has urged member states to check Japanese food imports for radioactivity. UPDATE 8:53 PM EST WEDNESDAY 3/16: LA Times: Within days, nuclear radiation released from Japan’s damaged Fukushima reactors could reach California, but experts say the amount that makes its way across the ocean should pose no danger. UPDATE 1:27 AM EST THURSDAY 3/17: Yesterday the US National Nuclear Security Administration declined to provide me with a model that it has developed predicting the path of Japan’s radiation plume. But a model developed for the United Nations was obtained by the New York Times from an anonymous source. It shows the plume missing Asia, heading across the Pacific, and smacking into the West Coast. Officials say that it will be too diluted by then to pose a health threat, but that hasn’t stopped Californians from making a run on potassium iodide. UPDATE 1:40 AM EST THURSDAY 3/17: This morning in Japan, the Japanese military flew four helicopters over the #3 reactor, dousing it with 7.5 tons of salt water each time. Japan’s NHK-TV reports that there was no change in radiation levels coming from the reactor after the water drop, though the temperature of the reactor went down. Japan’s Prime Minister, Naoto Kan, also announced plans for a ground effort to contain #3 that will involve 11 fire trucks with water cannons. 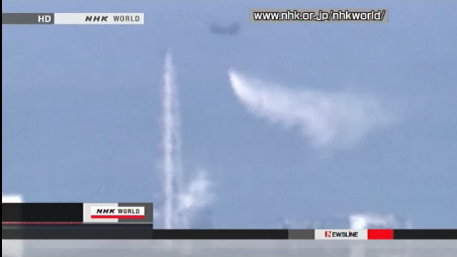 A helicpoter dropping water on the Fukushima Daiichi nuclear plant@JPN_PMO. Also Thursday morning, workers began the process of restoring power to the battered plant, which it will need to run its cooling operations. But a TEPCO official said that the top priority remains getting the #3 and #4 units under control. UPDATE 2:15 AM THURSDAY 3/17: Weather forecasters in Japan predict that winds will continue to blow the radiation out to sea until Friday, when the winds arer predicted to shift north, which could be bad news for large parts of the country if the reactors aren’t contained by then. UPDATE 7:41 AM, THURSDAY 3/17: A good primer from the National Journal on what is—and is not—going on with the nuclear reactors in Japan. UPADATE 10:21 AM, THURSDAY 3/17: With the crisis in Japan still far from over, the debate in Washington is quickly shifting toward domestic policy: Specifically, what to do about nuclear power in the United States. On that note, the Union of Concerned Scientists is out with a new report today examining more than a dozen “near misses” at nuclear power plants in the United States in the last year, and the response by the Nuclear Regulatory Commission, the federal government’s atomic watchdog. For instance, at Indian Point Energy Center in Westchester, New York, “the NRC discovered that the liner of a refueling cavity at Unit 2 has been leaking since at least 1993.” The takeway: “The NRC is capable of functioning as a highly effective watchdog, but also makes clear that much work remains to be done before the agency can fulfill that role as consistently as the public has a right to expect.” We’ll have more on that in a little bit, but you can check out the report here. UPDATE 10:37 AM, THURSDAY 3/17: Via the Atlantic, Singapore’s Straits Times has a fascinating profile of a worker for Tokyo Electric Power Co, the company that runs the Fukushima plant. With TEPCO facing criticism in Japan for its management of the facility and its reaction to the disaster, Michiko Otsuki took to her personal blog to defend the company: “To all the residents (around the plant) who have been alarmed and worried, I am truly, deeply sorry. I am writing my name down, knowing I will be abused and hurt because of this. There are people working to protect all of you, even in exchange for their own lives.” She’s since shut down the blog. UPDATE 10:52 AM, THURSDAY 3/17: NHK reports that 30 km (approximately) 19 miles to the northwest of Fukushima, radiation levels are still dangerously high: “Experts say exposure to those levels for 6 hours would result in absorption of the maximum level considered safe for 1 year.” This is noteworthy because the Japanese government has thus far warned residents to stay indoors if they’re within 30 km of the plant. UPDATE 11:17 AM, THURSDAY 3/17: Just how frequent (and powerful) have the aftershocks in Japan been? Paul Nicholls has put together a really striking mash-up charting all of Japan’s earthquakes on Google Maps, in real-time. Check it out. UPDATE 1:12 PM, THURSDAY 3/17: In case you missed it, here are a few key updates from late Thursday afternoon in Japan: Five military trucks sprayed water into the reactor Unit 3 for an hour, yet their efforts were inconclusive. With the spraying discontinued for the time being due to high radiation levels, evidence suggests that the situation is still dire and may soon go out of control, if that hasn’t happened already. UPDATE 3:32 PM THURSDAY 3/17: The helicopters that dumped water on the Fukushima plant today also took photographs. The images apparently confirm fears that the pool at reactor #4 has boiled dry. Officials at TEPCO said that a power line being strung to the plant won’t be completed until Friday at the earliest. At any rate, a resumption of electrical current won’t be a silver bullet. According the the LA Times, the line probably will not provide any benefit to reactors 1, 2, and 3 because the cooling systems are thought to have been damaged by hydrogen explosions. TEPCO has now brought 320 workers onto the site, up from yesterday’s skeleton crew of 50. Because of the extremely high radiation levels in the area, Gregory Jaczko, the chairman of the US Nuclear Regulatory Commission, fears that the workers will suffer lethal radiation doses, despite their protective gear. UPDATE 5:12 EST 3/17: Americans are getting sick from popping potassium iodide pills. According to the American Association of Poison Control Centers, at least seven people have reported reactions to the drug. Two were suffering from serious symptoms such as vomiting, racing heart, or diziness, according to MSNBC’s JoNel Aleccia. Given the fact that Japan is thousands of miles from the United States, it is highly unlikely that Americans would be exposed to radioactive material from direct inhalation of a plume from the Fukushima nuclear complex. While wind patterns will likely carry the radioactive plume eastward, radioactive material will be so diffuse by the time it reaches Hawaii, Alaska, or the mainland United States that it is highly unlikely to create significant health concerns. Regardless, there are reports that global supplies of potassium iodide are being depleted because Americans are buying them, prompting fears that there will not be an adequate supply in Japan should there be a larger radiation release. UPDATE 5:31 PM EST THURSDAY 3/17: MoJo’s Julia Whitty has just posted this piece about efforts to model the long-distance movement of Japan’s radiation emissions. There are still a lot of unknowns, including the degree to which the emissions will contain plutonium, which is highly harmful to humans. UPDATE 6:31 PM EST THURSDAY 3/17: The danger posed by the spent fuel rods at the plant now outweighs that of a core meltdown at Unit 3 and the other reactors. The plant holds 11,125 spent fuel assemblies—four times the amount of fuel in the plant’s reactor cores. The troubled reactor #4 holds 1,479 of those assemblies, including 548 that were removed in November and December and may be emitting more heat than the older rods. This could be one reason why the head of the NRC has been raising so many concerns about #4. [ED NOTE: The numbers in this paragraph, based on an early version of a NYT story, have been corrected and updated]. In the longer term, the problems with the storage pools will have major implications of US nuclear policy. While many countries try to minimize the amount of spent fuel kept at plants, the United States, like Japan, stores large amounts of spent fuel at nuclear generating sites. Yucca Mountain was supposed to solve that problem before it got derailed by political opposition. Here’s the definitive Mother Jones feature on Yucca. UPDATE 6:52 PM EST THURSDAY 3/17: From MoJo’s Dave Gilson, clips of 5 nuclear propaganda films from the Cold War to the present. See also our magazine piece on how the nuclear PR industry has harnessed enviros to do its bidding. UPDATE 7:38 PM EST THURSDAY 3/17: Japan being Japan, school kids are wearing shiny hats to protect them from radiation that make them look like something out of a 1950s sci-fi film. Japan Today has a photo. NPR has a bunch of explainers on reactor status, concerns about plutonium, and what will happen to the Fukushima workers, among other things. CNN is reporting that efforts to cool Unit 3 have been “somewhat effective” and that there has been “no significant worsening” of the situation over the past 24 hours. UPDATE 3:02 AM EST FRIDAY 3/18: The situation at the plant remains much the same as yesterday and may have improved slightly. The worst radiation has not spread beyond the 19-mile evacuation zone established by Japanese authorities. In Tokyo, readings remained at near background levels, at .0483 microsieverts. Radiation levels at the western gate of the plant fell slightly overnight, from 309 milliseverts an hour after Thursday’s 3:30 p.m. spraying to 271 millisieverts an hour as of 7:30 a.m. Japan time. Readings taken roughly 1 kilometer from the plant also dropped consistently from Thursday afternoon through Friday morning, though TEPCO stopped short of calling the move a trend. In past days, the radiation levels at the plant have tended to fluctuate widely. On Friday morning, 30 extra fire crews arrived at the plant from the Tokyo fire department. That afternoon, video footage appeared to show fire trucks spraying the #3 reactor with water cannons. Japanese military authorities said seven trucks were working the site, approaching the reactor one after another to spray their contents and then move off to minimize radiation exposure to the workers. Japan continued to be urged to release more information about the disaster to journalists and the international community and to accept more aid. Though the nuclear disaster continues to attract the most international media attention, the death toll from the earthquake itself has been considerable. The confirmed dead topped 6,539 on Friday, surpassing the death toll of Japan’s 1995 Great Hanshin Earthquake. About 10,000 more people are missing. It is safe to say that this is the largest natural catastrophe in post-war Japan. UPDATE 10:57 AM EST FRIDAY MARCH 18: Japan has raised the threat level for the incident to a 5. It had previously been listed as a level 4 on the International Nuclear and Radiological Event Scale, which runs from 1 to 7. See also our new piece on the site, “How Bad Could Japan’s Nuclear Crisis Get?” that looks at some of the worst case scenarios if they can’t get these reactors and spent fuel pools under control. UPDATE 11:28 AM EST FRIDAY MARCH 18: The Japan Atomic Industrial Forum, the trade group representing the industry, has been regularly posting spread sheets on the status of the reactors that provide some insight into what’s actually happening there—perhaps more than all the official press conferences from the government and TEPCO. Comparing yesterday’s last update with the most recent makes it appear that things are getting worse. The latest update, posted at 6 p.m. local time in Japan, states that the fuel is exposed in reactor units 1, 2, and 3. Yesterday the report said that each was about half-full of water. The report also notes that water levels remain low in the spent fuel pools at Units 3 and 4 despite attempts to inject water. UPDATE 2:00 PM EST FRIDAY MARCH 18: New York Governor Andrew Cuomo has announced that he wants to shut down the Indian Point nuclear power plant. Yesterday, the Union of Concerned Scientists released a report suggesting that a liner meant to provide protection in the event of an earthquake has been leaking since at least 1993. An MSNBC analysis of NRC data suggested that, of all US nuclear plants, Indian Point is most vulnerable to an earthquake. The plant’s Reactor No. 3 is atop a fault line. The chance of core damage at Reactor 3 is estimated at 1 in 10,000 each year. According to NRC guidelines, that is on the verge of requiring “immediate concern regarding adequate protection” of the public. The Indian Point reactor is 38 miles from New York City. UPDATE 3:42 PM EST FRIDAY MARCH 18: The Guardian has a particularly tragic story about some of the elderly residents near Fukushima that are suffering in the wake of the accident, after caretakers at a hospital near the plant apparently fled in fear. They report that 128 elderly people were found abandoned in a hospital six miles from the plant. “Most of them were comatose and 14 died shortly afterwards,” they report. This is in addition to a lack of food, water, and power in many parts of the country following the earthquake and tsunami. UPDATE 12:35 AM EST SATURDAY MARCH 18: Is Fukushima the new Chernobyl? ProPublica’s Lois Beckett has a good explainer on how the two accidents differ. In general, Fukushima is expected to be much less severe, but effects on local water quality may actually be worse. In a written statement, TEPCO president Masataka Shimizu said, “We sincerely apologize . . . for causing such a great concern and nuisance.” CNN reports that the company’s managing director, Akio Komiri, broke down in tears after leaving a news conference in Fukushima where radiation exposure levels were discussed. While radiation levels are still high around the plant, they have shown no sign of spiking elsewhere in Japan. UPDATE 10:21 AM EST SATURDAY MARCH 19: Japanese officials have confirmed that high levels of radiation have been detected in milk and spinach from farms near Fukushima. As the New York Times notes in their report this morning, these findings “are likely to further unsettle a nation worried about the long-term effects of the damaged nuclear power plants”—which is probably a bit of an understatement. UPDATE 11:14 AM EST SATURDAY MARCH 19: Is newer nuclear technology safer? The nuclear industry has always claimed so, but the unfolding crisis in Japan suggests otherwise. An MIT nuclear safety expert tells Mojo’s Josh Harkinson how one discontinued technology might have helped prevent the crisis. Tellingly, GE is going back to the future in designing its next generation of reactors. UPDATE 6:47 PM EST SATURDAY MARCH 19: Bloomberg has a great piece of reporting on the history of corruption and cover-ups at TEPCO and the Fukushima Daiichi plant. It’s long, but well worth reading for anyone who wants to understand the messed up state of nuclear safety in Japan. Tokyo Power Co.’s slip-ups over the years are too numerous to mention here. Most notably, they include a coverup of flaws in the containment vessel of reactor Unit 4 that should have required the whole thing to be scrapped. An official involved in the cover-up later brought it to light in “Why Nuclear Power is Dangerous,” a book published in 1990 that detailed his experiences. UPDATE 7:14 PM EST SATURDAY MARCH 19: TEPCO reports that power has been restored at two generators at the plant—but not the ones that are in the most distress. The Los Angeles Times reports that power is back on at units 5 and 6 and the cooling systems are functioning. Those two units were offline at the time of the earthquake and tsunami, but this is really the first good news from the site in the past week. Units 1, 2, 3, and 4, though, are still without electricity. 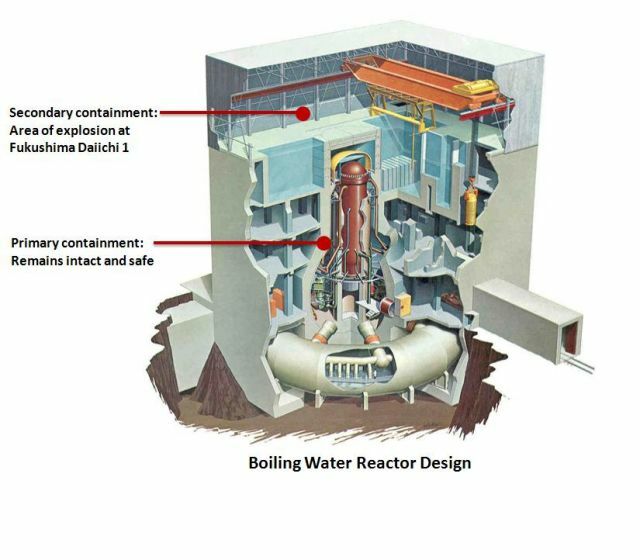 Even if power is restored to those reactors, it’s not certain that it will be entirely effective, though, since damage to the cooling systems is suspected at units 1, 2, and 3, and there may be a crack in the spent fuel pool at Unit 4. UPDATE 2:14 PM EST SUNDAY MARCH 20: Efforts continue power and restart the cooling systems at the remaining reactors. Appearing on CNN on Sunday, US Energy Secretary Steven Chu said that that the Obama administration believes that the worst of the crisis is over. Japanese Deputy Cabinet Minister Tetsuro Fukuyama told the Associated Press that “we are very close to getting the situation under control.” Still, many problems and uncertainties remain. Pressure unexpectedly rose again in today in another reactor unit, which might require plant operators to release more radioactive steam. Winds that have fortuitously carried radiation out to see over the past week reversed today and are now expected to carry it inland. The size of the area that will be contaminated is still unknown. UPDATE 10:42 PM EST SUNDAY MARCH 20: Japanese officials have reported radiation levels 27 times higher than the legal limit in Hitachi, a city 62 miles south of the Fukushima nuclear power plant, though they say that the levels aren’t high enought to affect human health, Kyodo News reports. High levels of radiation have also been detected in the tap water in nearby towns. The government has stopped shipments of milk from the Fukushima Prefecture and as well as spinach from Ibaraki Prefecture, the New York Times reports. UPDATE 11:11 AM EST MONDAY MARCH 21: Work at the reactors was again delayed today after smoke was seen rising from the two of the reactors. Smoke appeared to be coming from units 2 and 3, and concerns about radiation release from the units prompted an evacuation of the crews working to restore power to the reactors, Kyodo News reports. The latest development has delayed work at the site until Tuesday. UPDATE 4:31 PM EST MONDAY MARCH 21: The Nuclear Regulatory Commission announced Monday that a 90-day review will be undertaken at all US nuclear power plants (via The Hill’s E2 Wire). They also called for a longer-term review process that draws the situation in Japan. E2 Wire also notes that Rep. Darrell Issa (R-Calif.), chairman of the House Oversight and Government Reform Committee, also called for a reexamination of our nuclear plants over the weekend. And California lawmakers called on utilities to do detailed seismic maps before seeking new licenses for their power plants, one of which lies over a fault line. UPDATE 12:45 PM EST TUESDAY MARCH 22: TEPCO has now hooked up power lines to all six of the plant’s reactors, the AP reports. But the company added that workers need to check all of the cooling systems for damage before switching the power on, a process that could take days or even weeks. TEPCO also said today that more water injections are needed to cool down reactor units 1, 2, and 3. In the Blue Marble today, Mojo’s Joe Kloc has produced an illustration of GE’s Mark 1 reactor in the mode of a NY subway map. And Kate Sheppard highlights a speech given last August by the director general of the International Atomic Energy Agency in which he said that nuclear plants “need not be far from urban areas.” Oops. UPDATE 3:34 PM EST TUESDAY MARCH 22: The spent fuel pool at the unit 2 reactor was spewing steam late Tuesday, forcing workers to suspend other work to douse the reactor building with water, reports the New York Times. The Times has questioned whether in the aftermath of the earthquake TEPCO waited too long to inject sea water into the plants due to concerns about destroying expensive equipment. The paper also delves into the cozy relationship between TEPCO and Japanese nuclear regulators. Just a month before the earthquake, regulators approved a 10-month operating extension for the oldest of the six reactors despite warnings about its safety. UPDATE 1:03 PM WEDNESDAY MARCH 23: A map of radiation levels in Japan released by the US Department of Energy on Tuesday evening indicates that potentially dangerous levels of radioactive contamination have spread beyond the 13-mile evacuation zone surrounding the Fukushima Daiichi nuclear plant. We’ve posted one of the maps here. Radioactive iodine detected in Tokyo’s water supply spurred the head of the city’s water department to recommend today that infants not drink tap water. Home to 12 million people, Tokyo is Japan’s capital and largest city. The announcent immediately caused a run on bottled water. TEPCO continues to struggle to get its reactors under control. Late Wednesday afternoon, reactor unit 3, which contains plutonium-based mox fuel that is particularly toxic to humans, began billowing smoke, forcing TEPCO to evacuate workers from the area. The smoke ceased after about an hour. Only units 5 and 6, which weren’t operating at the time of the earthquake, can be considered stable. UPDATE 12:44 PM EST THRUSDAY MARCH 24: Three nuclear workers suffered radiation burns while trying to connect an electrical cable to a crucial pump at the unit 3 reactor, the only reactor containing dangerous mox fuel. Radioactive water overtopped their boots and scalded their legs. Two of the workers were hospitalized. A government official said that they were exposed to more than 170 millisieverts of radiation, which is still less than Japan’s new legal limit of 250 millisieverts for nuclear response workers. This suggests that Japan’s limit may be too high. In Tokyo, where city officials had advised that infants not drink the tap water, at least one water purification plant reported a drop in radioactive iodine levels. The reason for the drop is unclear. Unlike radioactive cesium, which has not been detected at unusual levels in the water, radioactive iodine has a relatively short half life and therefore will dissipate over time. According to the New York Times, officials at Japan’s Nuclear and Industrial Safety Agency said that reactor units 1 and 4 were releasing white smoke, but that it was not interrupting repair work. As of Thursday, the death toll from the earthquake stood at 9,500, with more than 16,000 people missing. Fixing damage from the quake will cost an estimated $300 billion, making it the world’s most expensive natural disaster. Contaminated water likely seeped through the containment vessel protecting from the reactor’s core, said Hidehiko Nishiyama of the Japan nuclear and industrial safety agency. Three men working inside the No. 3 reactor stepped into water this week that had 10,000 times the amount of radiation typical for that locale, Nishiyama said. That water likely indicates “some sort of leakage” from the reactor core, signaling a possible break of the containment vessel that houses the core. Prime Minister Naoto Kan also spoke on the situation for the first time in a week, indicating that they are “nowhere near the point” of resolving the crisis. The government has also asked those living up to 18 miles from the site to evacuate, after previously advising them to remain indoors. UPDATE 2:00 PM EST FRIDAY MARCH 25: Yesterday, Josh Harkinson discussed Japan’s nuclear crisis on a panel organized by the Asia Society. He was joined by Joohong Ahn, a UC Berkeley professor of nuclear engineering and native of Japan; Chuji Ando, a colonel in Japan’s Air Self-Defense Force and Hoover Institution fellow; and Steven K. Vogel, a UC Berkeley political science professor who specializes in Japan. UPDATE 12:00 PM EST MONDAY MARCH 28: On Sunday, officials announced that they had found puddles of water at two reactors that contained levels of radiation 10 million times higher than normal. Later that evening, TEPCO walked back that estimate, calling it “not credible.” To be clear though, the radiation levels are still very high; Reuters reports today that the level in water in one reactor is still 100,000 times higher than normal. UPDATE 12:30 PM EST TUESDAY APRIL 11: The threat level for the Fukushima plants has been raised to 7—the highest on the scale and now equal to the 1986 Chernobyl disaster. While officials say that the radiation release so far is only about 10 percent of Chernobyl’s, they anticipate that this disaster will continue for quite a long time. Is Newer Nuclear Technology Safer? How Bad Could Japan’s Nuclear Crisis Get?